Have you ever had one of those weeks, where, one minute you're feeling a bit grumpy because it's Monday morning, and then, in a blink of an eye, you look around, a bit dazed, realise it's Friday and think 'what just happened'? This is exactly what I'm feeling as I find myself telling you it's time for a great new Sketch over at Sketch Saturday. We have a generous prize from Simon Says Stamp if you fancy joining the fun. I hope you have time to pop over and see the gorgeous creations from the rest of The Saturdays. I think this is a fab Sketch and I was really looking forward to playing with it, but I really struggled to pull it together. The string of phone calls I had from Estate Agents didn't really help Mojo perform to her best, and every time I look at this card, I feel a bit deflated about it. But. I am happy with how fluffy my Pickle Penguins look. I normally colour them in much darker colours, but I wanted to have a go at a cutsey grey pair. Et voila! 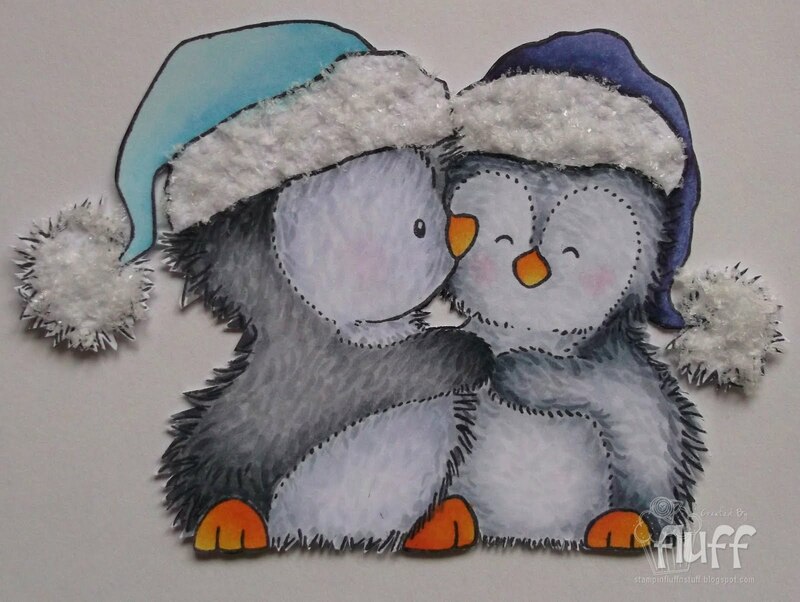 Goodmorning Fluffy....what a gorgeous card...your pinguins look so real...they invite to be hugged!! Have a wonderful weekend! Oh Faye, please don't feel deflated as this card is just adorable and your colouring of those two little cuties is superb sweetie! P.S. Now I'm worried about Estate Agents ringing, please don't tell me you're moving again? Let me know! Wow, can I please have a lesson on how to colour fur like that - amazing! Oh my gosh! They really do look fluffy! That fur is fabuliciously megamazingly wonderful! Good thing I didn't have to try and say that out loud huh? This card is gorgeous and those penguins really look fluffy - great colouring. and the big spotty paper works perfectly against the embossed dots behind the penguins. Please look at it again, surely you can see how FAB it is? By the sounds of it, you've had a busy week too. I love your cute card Faye, those penguins are so cute and a great sketch! I am with you, girl, this week just flew by! How very dare you be disapppointed this card lol!!!! Hope you have a fab fluffy weekend. Those penguins do look fluffy! Very cute card. Gorgeous card sweetie I love the embossing & the penguins are just awesome. Love 'em!!! Just back from Muvergate!!! Your fluffy penquins have cheered me up no end. luv Muv. Oh how sweet those little penguins are - I LOVE penguins! This card is adorable, no fretting! Those penguins are so super sweet! Hope this week goes a little better for you! I also think this week has flown, and now I'm getting a bit fed up with all the Christmas stuff being thrown at us when I don't feel Christmassy at all! Oooh I do hope you don't mind me ranting on your blog, apologies for going off into one. Aww, Faye, this card is absolutely adorable. The texture you've given to their fur is amazing! Those two are so sweet! Love all the cute little details! This is just a great WOW!!!! Oh my word Faye this is totally cute and adorable that image is terrific so is the colours and design, super card. Awwww i love it Faye & your colouring on your Penguins is amazing sweetie! !